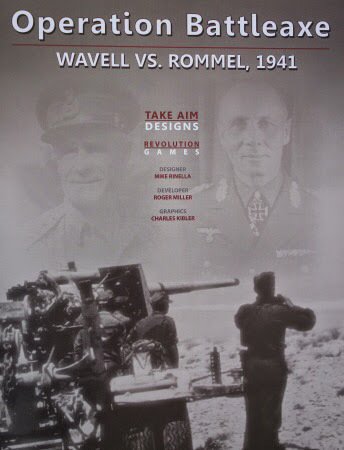 Operation Battleaxe, Wavell Vs Rommel, 1941 covers the Allied offensive in North Africa during June 1941. The game is a joint venture between designer Mike Rinella (of Take Aim designs) and game publishers Revolution Games. The game uses the Area Impulse system, similar to that used in some of Mike's other designs such as Monty's Gamble and Breakthrough: Cambrai and the games in the 'Storm Over' series such as Arnhem and and Stalingrad. As usual, this post will highlight game play by way of an AAR. Battleaxe is a ziplock production with a half sized map (22" x 17") and large counters. The artwork is by Charles Kibler and not only does the game look nice, but the way the counters have been done, they are a joy to use, clear icons and large easy read combat factors with a halo that lifts them away from the background colour. The engine of the game is the impulse system. A campaign day is divided into a number of impulses. In each impulse the Allied player activates one area and uses those units. Then the German player activates one area (or two depending on the fuel situtation) and uses those units. In the German part of the impulse, two D6 are rolled and if the score is less that the number of impulses played so far that day, then the day ends. If not another impulse is played. Above - this is the set-up. The boxes around the edges of the map are called zones and the inner map is made up of irregular shapes called areas. Each is numbered for identity and given a value to represent the defensive value of the terrain. The four boxes (zones) on the left and lower left edge have Allied markers in them and their offensive springboards from here. 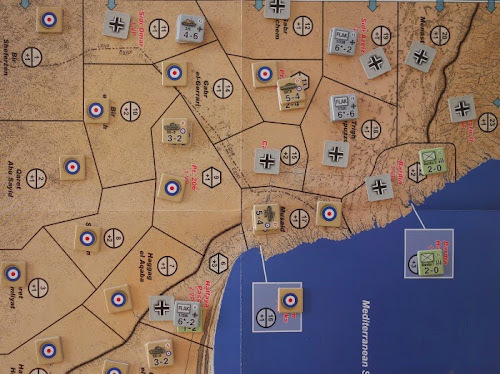 All other areas and zones have a German control marker in them, except Tobruk (top right box). This is Allied controlled and it is presently isolated and under seige. There are just 3 days represented in the game (extendable to 4), so if we say that statistically an average day will last for 7 impulses, then this is a game that plays very quickly and players do not have the luxury of activating areas just 'to see' how things go - activations are precious and players will constantly have a sense of having to make tough choices to maximise their limited activation potential. In this game, activated units do not become spent for the rest of the day (as is the case with some Area Impulse type games). They can be re-used throughout the turn and the flip side of the counter instead represents a strength loss. Overall the game flow is that on day one, the Allies will try to make their big gains. On day two, a couple of major German formations will be released and things get harder for the Allies. By day three, the game could be going in any direction depending how well one side or the other does on day two. The prime Allied objective is to open a supply line from one or more of their starting zones to the beseiged Allied troops in Tobruk. If the prime objective is fails, the Allies will win by securing 10 or more victory points. This is done by holding VP areas which are scored at the end of each day and inflicting casualties on German (not Italian) forces, which are calculated at the end of play (as some units are able to return to play via the replacement rules). At the start of play, the German have two strong formations (15th Panzer Division and 5th Light Division) that cannot move or attack unless certain conditions are met. 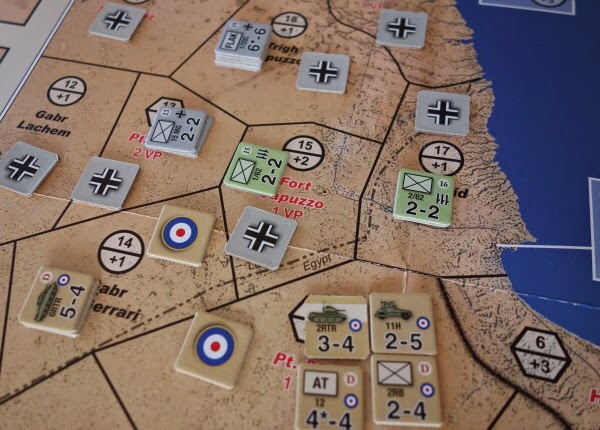 This gives the Allies some freedom in their opening moves without fear of an effective German counter-stroke, but if they push too far forward, those units, particularly the 15th Panzer, get released early. The map zones around the map edge are supply sources and give some scope for off map movement to circumvent escarpments etc. Above - The two white circles show 15th Panzer Division (lower circle) and 5th Light Division. The Yellow line indicates a typical supply line that needs to run from at least one of the 4 Allied supply zones to the Tobruk zone for a sudden death type win and the red lines show uncrossable escarpments that add interesting nuances to how the map can (or cannot) be traversed. Day 1 - 15th June 1941. Impulse 1. The Allies get a special opening activation that allows them to activate all four zones at once. The Allies advance along a broad front, including a movement along the coast into Quaret el Reteim. The escarpment here constrains them, so the only way out is ahead and here the German held strategically important Halfaya Pass, blocks them. The German plan is to sit tight, use their outposts as speed bumps and hope for an early activation of 15th Panzer Division. So the Germans pass in this impulse. Above - This is how the scene looks after the first impulse (looking up the map from the south). Note I have made a mistake and advanced the 6-2 unit too far (into area 8), I correct this after spotting it in the next impulse. Impulse 2. The Allies activate area 10 (Bir el Hurush - also shown in the above photograph) to attack into area 9 (Pt. 206), containing the 2-2 unit and others above. Attack Process - The Allies take the 5-4 as their lead unit, so use its combat strength of 5. To that they add +1 for each other unit that they take into the attack for a total of +3, making 8. The Allies always get air support when they assault which adds a 1d6 to the attack rating. They roll a 2, so the 8 becomes 10. They also have 3 on call artillery missions available to use each game turn, of which one can be called to add +2 to the combat, but it must be diced for. They can use their allowance on a score of 1-3, which they get in this instance, so their attack value increases by +2 to 12. Finally, they can claim a +1 for having combined arms in the attack, to give them a final attack vale of 13. The defenders use the 4-6 as their lead unit and add +2 for the other two units stacked with it to give a defence strength of 6. They add +1 for the terrain value (see the value inside the hexshape in the area) to give 7 and then they roll for their on call artillery but fail to receive it, so their total defence value is 7. Each side now rolls 2D6 and adds the result to their modified combat value. The Allies roll 8 (plus strength 13) to give 21 and the Germans roll 4 (plus strength 7) to give 11. This means that the attackers win by a very substantial 11 points, which must be absorbed by the defenders by way of flipping units, removing units from play or retreating units. But this attack number is so large that even if the Germans were to remove all of their units from play, it would still only absorb 9 of the 11 points and as such, this becomes an overrun. An overrun allows the successful attacker to move / attack again into any adjacent area. Despite wanting to advance and attack again, this would bring them adjacent to 15th Panzer Division, which would then be automatically released and since the rest of the Allied army is lagging behind, the Allies choose not to conduct an overrun (see below - if they move into either Area 15 or 17, they will be adjacent to Area 18 at the top of the photograph and cause the release of the panzer formation stacked there). In any case, as a successful attacker, their lead unit must flip to its 3-4 side. It is this flipping that can take the steam out of an attack over the course of several impulses, because a flipped unit obviously does not want to flip again because it will be removed from play. Playing very aggresively carries the problem that there are never enough replacements to make good a lot of flipped units. Impulse 3 - The Allies activate a rear area to bring units up to the front. The powerful 7 RTR moves from area 3 to 10, shifting the formation towards the left flank of the Allied attack. Again the Germans pass, but with the passing of the third impulse it is now technically possible for the day to end, so they roll 2D6. If they score less than the impulse number the day ends. They roll 6, so it continues. 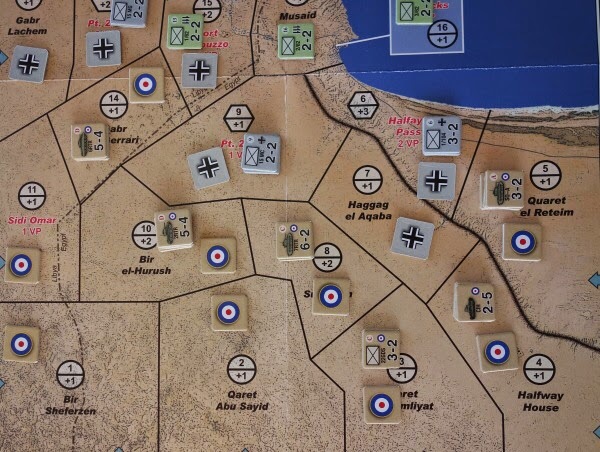 Impulse 4 - The Allies move 7 RTR again, into Sidi Omar (worth a VP) and are now fully on the left flank. The Germans (who can activate 2 Areas in each impulse depending upon the fuel situation) still choose to do nothing. They roll for the end of the day (get 7) and the day continues. Impulse 5 - 7 RTR continue to advance up the map into Area 12 (Gabr Lachem - see below). The Germans pass and roll for the end of the day (roll 5) which continues. Impulse 6 - 7 RTR attack from Area 12 into area 13 (Pt. 208, worth 2 VPs). Both the attacker and defender have lead units with combat values of 6. The final strengths before dice rolls are modified to 14 for the Allies and 9 for the Germans. 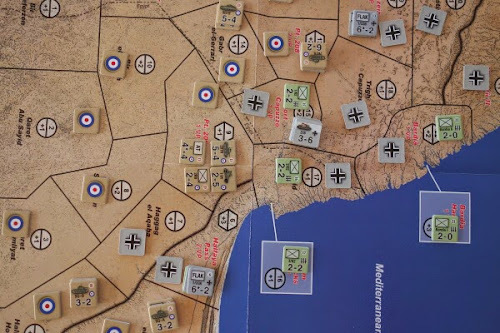 The Allies roll (2D6) 5 to give a total of 19 and the Germans roll 6 to give a total of 16. 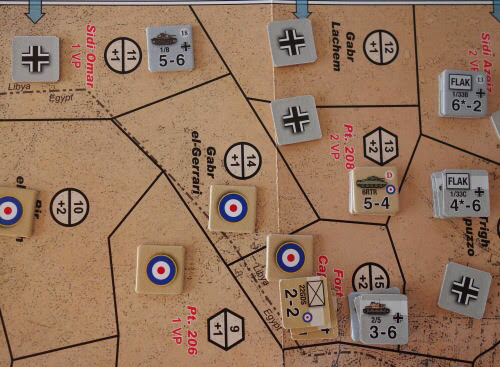 The Allied lead unit must flip and the Germans must absorb the 4 points (the difference between the two scores) of harm. Both of the German units choose to spend the four points by flipping and retreating both units. The Allies take possession of Area 13. As this is adjacent to 15th Panzer Division (just partly showing at the top of the photograph), the panzers are released. The German situation is serious. They have taken losses and lost important ground. The Allies have got themselves forward in strength and for the most part, if attacked, they will be stronger than 15th Panzer Division. 5th Light Division are still not released, so they cannot assist. With the day drifting ever onwards, the German player decides to make a bold but risky attack. 15th Panzer Division moves down into area 15 (Fort Capuzzo - see above) and onwards to strike into area 14 (Gabr el Gerrari). This stands a chance of puncturing the Allied line and putting 7 RTR at risk of having its supply line cut later in the turn. The Germans have a modified attack value of 10 and the Allies of 9. This is really down to the luck of the dice and since the Germans do not have possession of the Advantage Chit, they will not be able to reduce the effects of a bad outcome. The Germans make a DR of 4 to give 14 and the Allies a DR of 8 to make 17. The gamble has not paid off, the Germans are repulsed, which means that all of their units must flip and because they assaulted into the area (rather than starting the impulse already in the area) they must also retreat. They fall back on Fort Capuzzo. This is a most serious situation for the German player. They have units already knocked out of the game, 15th Panzer is now fully flipped, so is not in good shape to conduct attacks and the enemy have captured some good ground. The German roll of 4 in that combat is lower than the impulse number, so the day ends. The first DR that the Germans make in their impulse is always used to check for ending the day. If they do not attack, then the dice are just rolled to make that check. Refit Phase - Both sides have some limited potential to get replacements into the game. End phase - Both sides are fully in supply. The German 5th Light Division are automatically released. The Allies get 4 VP's for ground held and they retain the Advantage Chit. The Allies could surrender the Advantage Chit to the German player in return for a benefit, such as getting extra replacements or cutting German fuel, so they can't activate two areas in a single impulse, but the Allies feel that their position is so good, that they don't need to do this. Plus if they hand the chit to the German player, the Germans may then use it to have Rommel fighting at the front, which adds an extra 1D6 to German strengths in combat. Day two - 16th June Impulse 1. 7 RTR push into Fort Capuzzo and hit the weakened 15th Panzer Division, which retreat after combat. 5th Light Divison move down and retake the ground just vacated by 7 RTR. 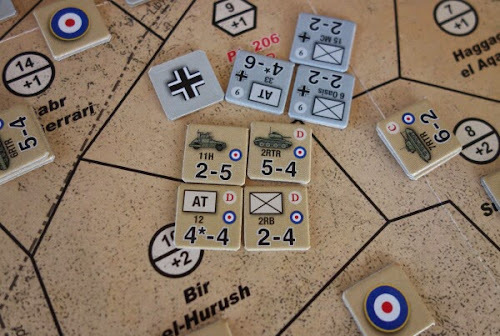 With their double activation 15th Panzer and 5th Light should be able to act together to counter-attack, but the shape that 15th Panzer is in means their options are quite limited for offensive action and will remain so throughout the rest of the day (until the refit at the end of the turn). 2nd RTR take Musaid, the Germans in Halfaya Pass are now cut-off. 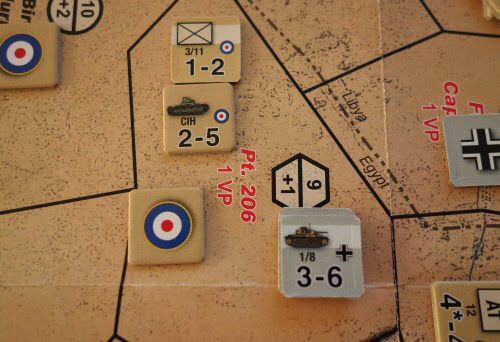 The Light Division tries to regain the initiative by attacking 7 RTR, they cause losses and 15th Panzer move up to cover the positions just vacated by the advance of the Light Division. 6 RTR gets a narrow victory over 15th panzer and re-captures Pt. 208. As the day moves on, the cluster of VP hexes around Fort Capuzzo is subjected to attack and counter-attack with little changing other than the grinding down of forces. The Allies take Sollum Barracks (1 VP) which is the first square set in the sea in the above photo. It actually sits within the Musaid Area above Halfaya Pass. The German 1/8 (of 15th Panzer) moves down their right flank and re-takes Sidi Omar and then moves to support the units at Fort Capuzzo. The fighting there sees all of the Allied units flip, they retreat but are pursued, resulting in the loss of 2nd Guards. The day ends after impulse 9. Refit Phase - Nothing other than Halfaya Pass is out of supply. There are some replacements but nothing like what is needed to put the German formations back into shape. End phase - The Allies get another 4 VP's (looks like they will win). At Halfaya Pass, the surrounded Axis units must test for surrender. All three of their units flip. The Allies go onto the offensive at Tobruk and clear the zone of Germans, removing two of the units from play and flipping and retreating the third. This frees up the the 9th Australian division to start to move down to Bardia, opening up the supply route from the north while 2 RTR push up the coast to Bardia from Musaid. The advace is checked at Bardia and elements from 15th panzer and 1/33c Flak move there to give support, but once the Australians arrive, Bardia falls. A supply route is now fully open from the Allied Zones to Tobruk and Tobruk is clear of enemy units. This will give the Allies a guaranteed victory in the End Phase (not that an Allied victory is in doubt anyway). The only option available to the Germans is to attack Pt. 206 to cut that supply line. They attack with flipped units, which is costly, but they infict a lot of damage. 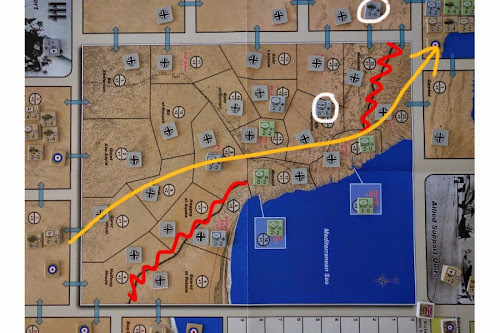 The Allied player plays the Advantage Chit to reduce the attack to just a stalemate, both sides have to flip their lead units, which removes the lead German unit from play and means that the Allied units just about hold onto the area. The Germans really are a spent force and conveniently the day ends in the following impulse. The refit phase is completed to see if that helps the German reduce their losses and the Germans at Halfaya Pass test again for surrender (they pass - their removal would have opened up another supply route running all the way to Tobruk). There is of course no doubt as to the Allied success. 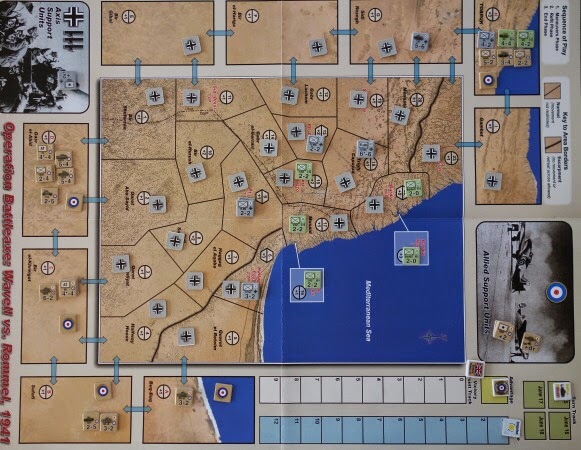 They win automatically for having opened a supply route to Tobruk, but if that had failed, they also win on Victory points (for locations held and casualties caused), having accumulated 15 VPs, with 10 being needed for a win. Conclusions - I have enjoyed playing this game and on the two occasions of play it has played differently. The game shows good playtesting and the rules are nice and tight. There is some minor v1 errata (2 items) that can be downloaded from the company website. In the past couple of days the 'advanced' rules have been released. I don't think the term advanced is justified and it may even put people off looking at them - the advanced rules make sense and just add some small bits without any burden at all. It looks like an opportunity was also taken to add in the errata and just tidy up a couple of sentences. All amendments are marked so the player knows what is new. The game gives a surprising amount of decision making for what initially just looks like a map of open desert with relatively few locations. The escarpments, fortified zones and the location of victory point areas really bring this playing surface to life. I also like the idea of the two areas (Sollum Barracks and Bardia Harbor - shown with their boxes in the sea) that are sub-areas, each set within another area, making these totally isolated and only accessable via the main area, adding even further variation to the games, especially as they are worth victory points. Our AAR didn't see Rommel in play or the Advantage Chit played to give the Germans fuel supply problems. The opening lack of activity by the Germans did not help them and then their losses in their daring strike by 15th Panzer really set them back and they never really recovered from that, leaving the Allied player quite happy to retain the Advantage Chit for the most part. 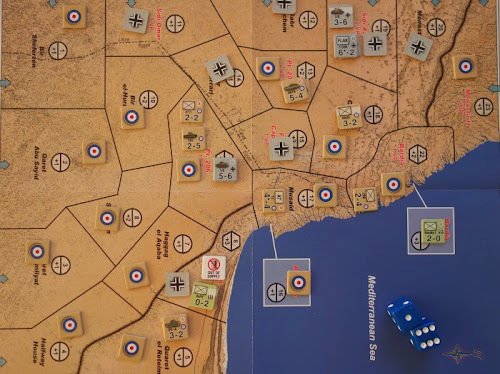 The final straw was the powerful attack the Allies made at Tobruk, allowing the Australian Division to move down on Bardia. All of these individual acts could have gone the other way and produced a completely different game. Overall, the game strikes a good balance between size, complexity and simulation. Size - Half sized map, low counter density and no play aids, make this an ideal game for the kitchen table and being zip-lock, it is easy to store. Complexity - The game does not offer a complexity rating, but on a scale of 1 - 5, I would place the game at around a complexity of 2. The system itself is quite easy to master, where the player has to be careful is in regards to a few small rules tucked away that add the chrome. It is handy when reading the rules for the first time just to jot these down, so that you have a reminder sheet. The game is like other area impulse games but there are subtle differences (as part of the streamlining in this game), but everything is straight-forward. The rule book is well laid out and Roger Miller of Revolution Games has a nack of spotting ambiguity and keeping things tidy. Within the last couple of days, advanced rules have been released. This is effectively a set of living rules with some small additions and sentence tweaks. Solitaire - This is a two player game that plays well solitaire. Uncertainty is always a good thing to help solitaire play and the variable ending of a turn via the impulse dice rolls brings that. Time - The web page suggested 2 - 3 hours, which seems about right. 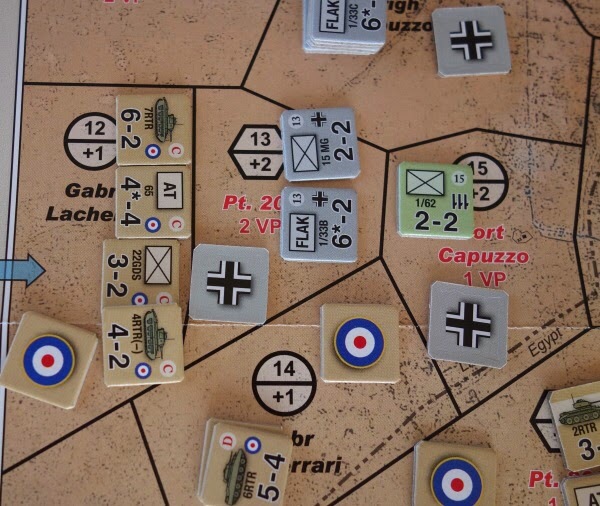 In our face to face game, day three ended very quickly when the Germans rolled 'snakes eyes' on impulse 4. We had been playing for about a couple of hours up to that point. This solitaire replay took a little over 2 hours. I just completed our eighth game replay over in the Battleaxe discussion at consimworld. We post map updates after every impulse so the action is easy to follow. Come check it out!